My week of rather lovely media exposure rolls on – last night a track from A Crack Where The Light Gets In was played on my favourite radio show ever. It’s not my favourite radio show because they played the tracks, it’s been that since before they started occasionally playing my music about 14 years ago. 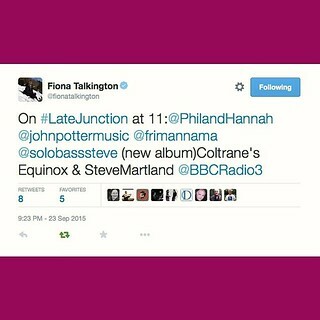 Listen to last night’s Late Junction here. Late Junction is, not to get too hyperbolic, an amazing example of what the BBC license fee does/did best… eclectic, joyous, and exploratory with none of the demographic limitations that commercial radio’s need to appeal to advertisers demand. I’ve discovered SO much music through Fiona, and earlier on through Verity Sharp. To have my music played in that context is an amazing validation of what I’m up to. The technical side of it is never discussed, there’s no ‘ooh, it’s so clever for a bass player to do this!’ – just my music alongside a whole load of the most beautiful, wide-ranging wonderfulness from around the world. As a validation of purpose, it’s about as good as it gets.